This decadent, chocolate smothered baileys coffee float is utterly delicious. The addition of ice cream makes a creamy, smooth and heavenly coffee float! Brew 2 cups of strong coffee in your favorite method. Measure out 3 oz of Bailey's into each mug. Place 2 scoops of chocolate ice cream in each mug and pour 1 cup of coffee overtop. 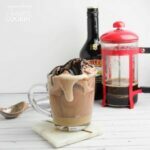 This recipe for Bailey’s Coffee Float was printed from AmandasCookin.com - https://amandascookin.com/baileys-coffee-float/ and can only be printed for education or personal use.